Continuing with the recent theme of sneaky high-selling artists, today’s feature is likely a household name, but perhaps one you haven’t thought about in a while. Rolling Stone has called her the ‘Queen of alt-rock angst,’ and over the course of 25 years or so, has sold over 75 million records worldwide. Alanis Morissette was born in June of 1974 near Ottawa, Canada. Mom and dad both taught in a military school, so her and her two siblings moved around quite a bit as kids. From ’77 to ’80 they lived in Lahr, Germany and returned to Canada shortly after that stint. Immediately after the return, she began learning piano and a year later, began dance lessons. While in elementary school, Alanis appeared in five episodes of Nickelodeon’s You Can’t Do That On Television. At age 13, she recorded a demo singing vocals while backed up by a prominent Canadian classic rock band. While not overly popular, it caught the eye of MCA Records who offered her a Canada-only deal in 1991. Featuring a dance-pop sound, the album saw solid success with our neighbors to the north. For reference, she was said to be a Canadian Debbie Gibson, if that helps you get a feel for the type of music. In spite of a follow-up album and further success, MCA completed the two-album deal and released her. With that, Alanis moved to Los Angeles on a mission to conquer the states. Learning to write with other proven stars, Alanis started to find her groove. Famed producer Glen Ballard began working with her and felt she was talented enough for studio time. Together they wrote and produced her first album, Jagged Little Pill and released it in June of 1995. Expectations were low, only hoping to break even or make enough to fund a sophomore release. Things changed in a hurry when influential Los Angeles radio station KROQ began playing the first single “You Oughta Know.” MTV quickly took notice as well, and soon the song was heard everywhere. Six singles later, the album stayed on the Billboard 200 for more than a year, and became the second highest selling female album in history. The success has stayed steady to date, with nearly 40 million copies sold worldwide. Winning five Grammy Awards in 1996/1997 for the album cemented her legacy even though she was new to the scene. You can’t understate how big Jagged Little Pill was in the mid-‘90s. Alanis essentially ran radio stations for the better part of 14 months. What’s even more amazing is how drastic of a departure this was from her previous sound. No one could have possibly predicted how going from straight up pop to this grungy, alt rock sound would work—let alone so incredibly well. Going from relative obscurity to #327 on the 500 Greatest Albums of All Time is no small feat. Her vocal is beyond unique, a mezzo-soprano with a small bit of Joplin-esque raspy-ness. The ability to drop that though, and belt out a beautiful ballad is uncanny, and really makes the album come full circle. Alanis dealt a lot with her raw emotions from her life experiences on the record, and I think that’s what made it such an over-the-top hit. It was relatable; and her indifference, rage and sadness was yours too—a brilliant strategy. While she never left the music scene, she never quite had the success of the debut. Rumor is she’ll be releasing new stuff this year; it’s been six years since she put anything out. 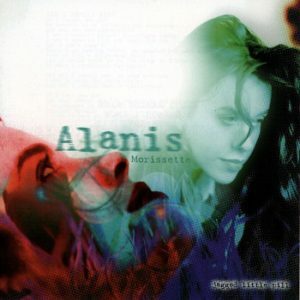 Alanis has done some TV, film and stage acting as well—but for me; nothing will ever take top billing over this album. It’s not at all ironic that the album holds up so well to this day, and for $5 bucks, you’ll fall head over feet for it. ‘Queen of alt-rock angst,’ – This is why my friend calls her “Alanis Moreupset”. Love her music. Great voice. Looking forward to her next album! Ha! That’s a good one. It will be fun to see how her music continues to evolve from this one. I’ll certainly give it a listen! Thanks for the comment!